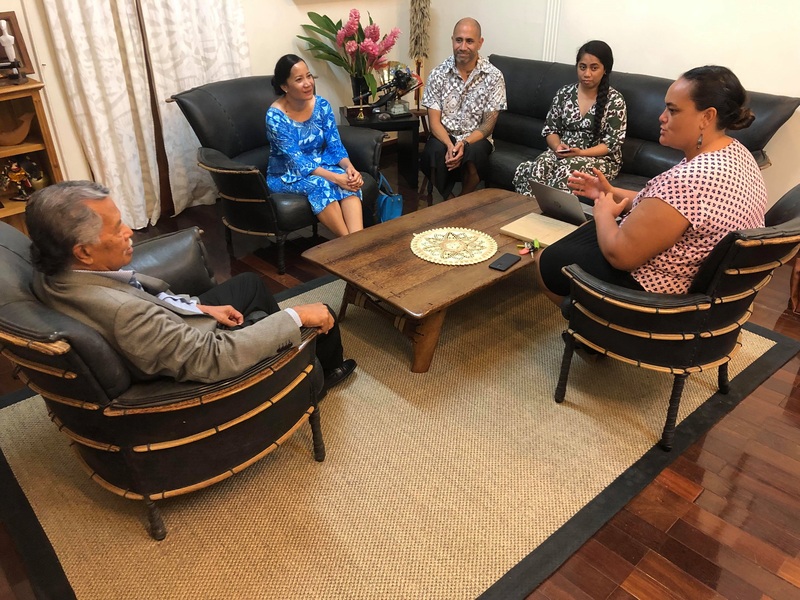 AVARUA, 10 April 2019 -- Forum Fisheries Agency (FFA) Director-General (DG) Dr Manu Tupou-Roosen visited Rarotonga this week to discuss current and future co-operation between the Cook Islands and the Honiara based FFA Secretariat. Dr Tupou-Roosen was appointed DG by FFA Ministers during the annual FFA Council of Ministers (FFCMIN 15) hosted by the Cook Islands in Rarotonga last year. Dr Tupou-Roosen highly commended Secretary Herrmann’s leadership as the officials FFC Chair and looked forward to working closely with Ministry of Marine Resources (MMR) Secretary Pamela Maru as she takes forward the chairing role through to its handover to FSM in May. “The Cook Islands is an important player and leader in our regional fisheries, and we’re particularly grateful for their collaboration with the Secretariat in their role as the FFC Chair this past year through Secretary Herrmann. 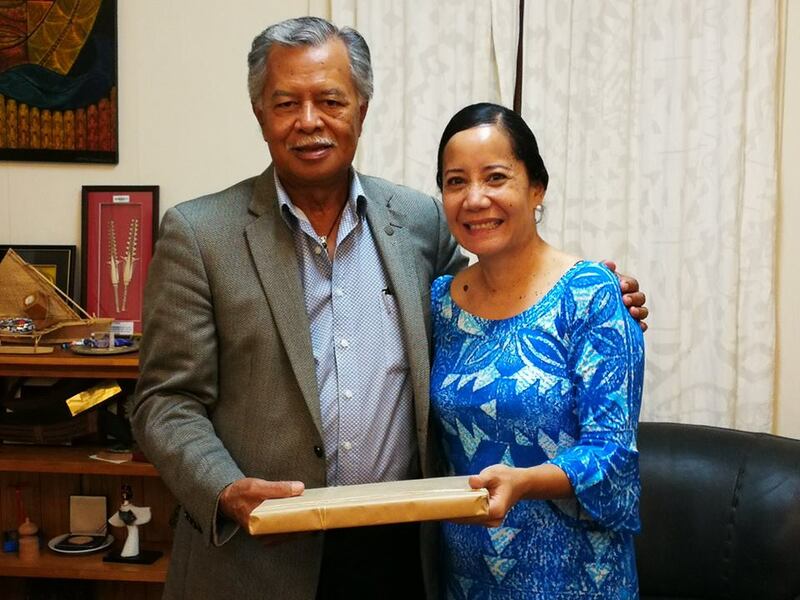 We sincerely thank our Ministerial Chair, the Honourable Prime Minister Puna, and his Government for the continued support to the FFA and for being a staunch supporter of regional cooperation. We very much look forward to working closely with Secretary Maru through to FFC next month. The cornerstone of our success in regional fisheries is cooperation and this will continue to drive the way we operate in serving the Cook Islands and all our Members” said Dr Tupou-Roosen. The visit provided an early opportunity to discuss the Cook Islands’ priorities as well as the FFA’s including its strategic focus for service delivery to countries, the 40th anniversary of the FFA and the establishment of a Regional Fisheries Ministers meeting to convene this year. As part of the visit, the MMR Secretary Maru, discussed with Dr Tupou-Roosen the Cook Islands strategic interests in securing long term rights to regional fisheries resources, and strengthening relationships with our Pacific neighbours. “Developing strategic partnerships enables the Cook Islands to investigate our fisheries development opportunities to meet national socio-economic and food security needs, whilst ensuring fisheries resources are managed sustainably within the wider regional fisheries management framework” Maru said. Ms Maru, who was employed by the FFA for 6 years as a Fisheries Management Adviser prior to her assumption of the MMR Head of Ministry position in January this year will head the Cook Islands delegation to the FFC Officials meeting which will convene in Pohnpei next month. MMR and MFAI will continue to strengthen collaboration with each other, and domestic and international partners in both the fisheries and oceans governance spaces in the coming months as both agencies look to elevate efforts to sustainably manage Cook Islands fisheries, whilst ensuring stable and secure access to regional fisheries resources. Note to editors: All pictures should be credited to Ministry of Foreign Affairs and Immigration, Cook Islands. The role of Foreign Affairs and its overseas offices is to provide Government with advice on the conduct of Cook Islands’ foreign policy, identify and understand international trends, opportunities and risks that may impact the Cook Islands and offer advice on how to protect and advance its interests. The Ministry also acts as the official channel of communication between the Government of the Cook Islands and other Governments and between the Government and International Organisations. The role of Immigration is to ensure our borders are protected by effectively screening entry and departure of people to the Cook Islands and facilitate the movement of labour while maintaining social harmony.